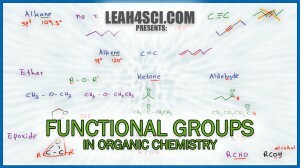 Functional groups are key to success in organic chemistry. In order to recognize reactive portions of a molecule, you must first recognize the functional groups that influence reactivity. But how do you quickly memorize the groups when they look so similar? This video breaks down the common organic chemistry functional groups to help you understand what to look for along with mnemonics and memory tips. This is Pre-naming Video in the Naming Organic Compounds Video Series. Click HERE for the entire series. A fantastic series of lectures , very clearly presented…Youve got a very easy listening voice as well. ah….. i m a fan of your explanation Leah…. thank u so much dear. i would like for the opportunity to improve my skill further.with Leah,chemistry becomes a joke. Glad to hear that, Serah! Love it, this really helped! This was an extremely helpful , Thank you so much !!! This was an extremely helpful amd easy to follow review! Thank you! Glad you like it Edwin!